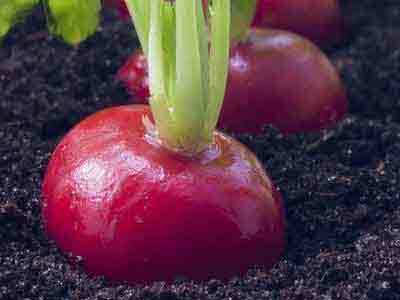 Radishes can be sown between the well-spaced rows of other vegetables which are good companions. Seeds for a lot of different varieties are available to buy. There are varieties of radish which are not just round but which are conical or cylindrical and in colours of red, red-white and yellow. There are two categories which are the early varieties suitable for sowing in spring or autumn and the summer radishes. They need a sunny to partially shaded location (not too hot) with good, loose garden soil. Radishes propagate generatively via seeds. You can sow radishes in heated greenhouses so that you can harvest them through the whole winter. Water regularly but only fertilise a little. If you water and fertilise too little, then the root will grow slowly, will be dry and woody. It's possible to grow them in batches at intervals of time. Always keep the soil moist and hoe regularly to keep flea beetles away. A cardboard collar around the root crown can prevent the cabbage root flies or cabbage white butterflies from laying eggs. Control: Regular wiping down can remove eggs or caterpillars from cabbage whites. If you wait too long with the harvest, they can become woody. Remove the leaves because they take moisture and nutrients from the root. Radishes can be wrapped in moist kitchen paper, and kept in a cool place (e.g. overnight on the terrace) for several days. Radish leaves can be prepared like spinach leaves.